Does your family pray before meals? Mine does. We say Grace in English AND in Spanish. 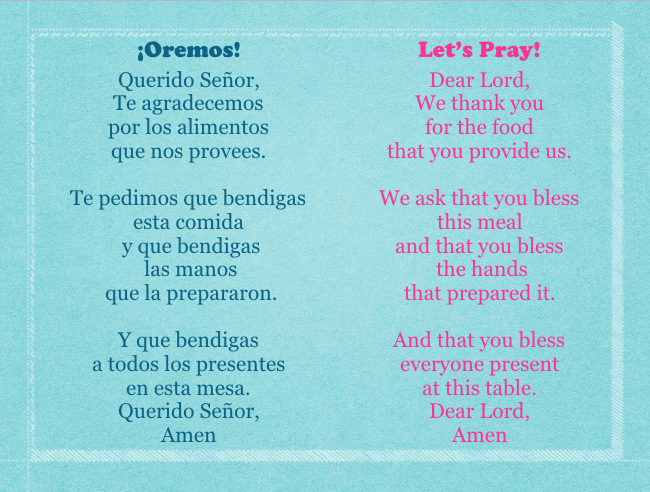 It's so exciting to listen to my kids and my husband, (and me of course), thanking God for our meals everyday in two languages! Here are four versions of the Mealtime Prayer sung by a mom and a dad. Listen and sing along. The song will help you and your children learn this beautiful prayer! YES! I WANT MORE SPANISH FOR MY FAMILY!